The 49ers swept two top 20 opponents and continue to roll through the season. Their earlier wins over Loyola Chicago and Lewis look even better now too as both of those teams moved up in the rankings. The Bruins fell for the first time on the season at Hawaii, but came back to defeat them in the second match of the series on Sunday night. Considering they went 1-1 on the road against a team that had a 26-home match winning streak and that their overall resume now features four top-10 wins (including over #3 and #4) they remain at #2. The Anteaters scored a pair of huge victories over BYU and own a resume that parallels with UCLA’s as the top two so far in 2018. They stay behind those Bruins though for the time being since they lost vs. UCLA, but they continue to be a title contender and could have easily won that match. The Rainbow Warriors had done everything impressively early in the season, but lacked a top 10 win. While they did have their home winning streak snapped, they also scored that victory over UCLA and showed they can even defeat the best of the best as they slide up a spot in the rankings. The Ramblers only losses are to Long Beach State and UC Irvine while they added two more quality wins to a bunch that is headlined by a five-set victory at BYU. That pushes them into the top five, one spot in front of the Cougars. Once again BYU will take on the same opponent twice in the same week, but this time it should be easier than going on the road against UC Irvine. They stay in front of Ohio State for now with a win in Columbus under their belt. The Buckeyes look to be rolling now as some of their new pieces are continuing to play better and better. That makes the two-time defending champs more than a threat, but for now they sit at seven behind a team they lost to at home and a top five that have fantastic resumes. Lewis has figured things out and have now won five matches in a row, including two big wins over teams from California. They’ll look to add to that tally vs. USC before facing their alumni match later in the week. Grand Canyon moves into the top 10 for the first time this season as they’ve now won eight of their first 10 matches. 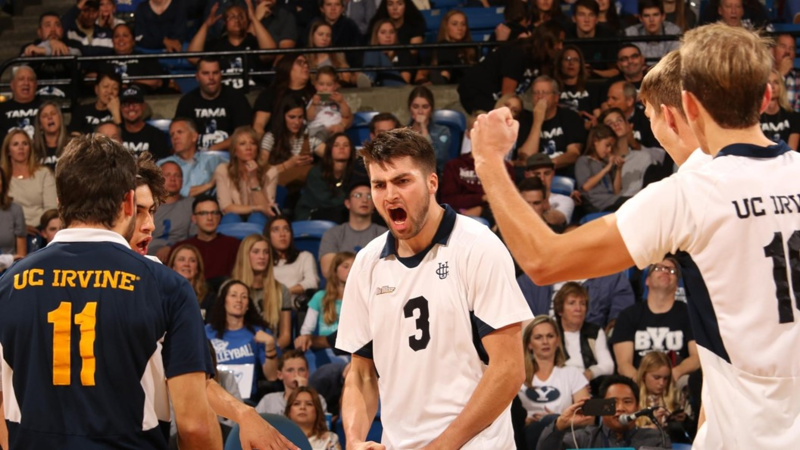 Time will tell if they can be a serious MPSF contender as they don’t have a top 15 victory yet, but they’ve looked impressive every other way and took UC Irvine to five in one of their losses. In a one-match week, the Nittany Lions lost at Ohio State. It wasn’t the loss that was bothersome but the fact that they couldn’t reach 20 points in any of the set. They can rebound this week though as they slightly hold onto a spot in the top 10. CSUN now has three consecutive four-set losses, but the good news is that Arvis Greene was back this week and put up some big numbers. Two tough road losses this week though isn’t the end of the world but they’ll need to find more balance around Greene. Saint Francis slides up a spot even with a loss because of what else happened in front of them. Their win earlier at UCSB in four sets also comes into play as they make the top dozen. After rising to the fringe of the top 10, UCSB suffered a setback with a pair of losses. Still, both came to higher ranked teams on the road, so they don’t drop too much. They can more than rebound this week with a pair in Provo. Pepperdine still doesn’t have a true signature win, but did earn a few nice pieces at GMU and on a neutral site against Ball State. They slide up a spot, but remain behind UCSB (who they lost to at home). Fort Wayne has been one of a few teams to emerge at the start of 2018 after not having much hype coming into the year. How good they really are will be on display this upcoming week with road matches against higher ranked opponents. The Trojans 3-0 start has quickly fizzled into five straight losses and a 3-5 overall mark. It won’t get any easier this week, but it’s once again another opportunity to score a big victory as they head to the midwest. UCSD lost for just the second time this season but they continue to not waver. Two teams ranked around where the Tritons are should push them this week as they look to get another winning streak going. Concordia couldn’t upend UC Irvine, but showed a lot in a four-set loss. It’s their second straight, but they also have a win over CSUN to pair with the two ranked losses which keeps them ranked. The Patriots leapfrog back into the VolleyMob Top 20, where they began the season, behind a big win over a Ball State team who was at the end of the ranks. They still have plenty to figure out but could ease plenty of minds with an upset of Ohio State this week. The Cardinal continue to struggle in the early season after coming in with high expectations. While all of their matches have come against teams currently ranked, they need to start scoring some victories. It won’t be easy as they continue what will amount to a seven-match road trip.